Bald’s Leechbook (London, British Library, Royal 12 D.xvii), folio 1r, available at the British Library’s Catalogue of Illuminated Manuscripts. By now, the news of the Anglo-Saxon recipe that kills modern day superbug MRSA is old (find a good article on it here). When news hit the internet a few weeks ago, my social media was buzzing with medievalists proud to point out the relevance of our work. I first found out about it because Judy (my wife), a microbiologist, shared a link, pointing out that it’s another way in which “Our nerd loves come together again”–just one example of medieval and modern science intersecting. Here it begins to tell about the birth of a person, how in his mother’s womb he turns into a human. First the brain of a person is developed in his mother’s womb, when the brain is covered over [on the] outside with membranes in the sixth week. In the next month the veins are developed, they are divided into 365 shorter and longer [veins] and then the blood flows into the feet and up the hands, and then he is divided into limbs and prepared together. In the third month he is alive and grows, and the mother lies witless and then the ribs are developed, then occur the many pains when the body of the fetus is shaped in her womb. In the sixth month he is covered with skin and bones are grown. In the seventh month the toes and the fingers are grown. In the eighth month the breast-area is grown on him and the heart and blood and he is all firmly set. In the ninth month certainly it is known to women whether they may give birth. In the tenth month the woman does not survive her life if the child is not born, because it may become a disease to her, most often on Tuesday night. The last line (about Tuesday night) also connected well to a previous prognostic reading, concerned with foretelling how being born on certain days of the week affect personalities and fates. 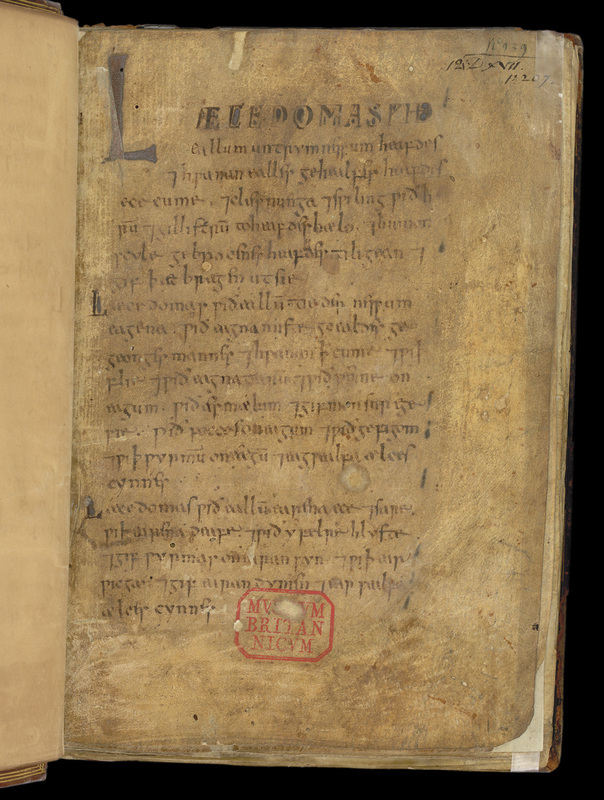 Since we were discussing Anglo-Saxon scientific ideas anyway, I brought in the Old English text of the recipe with a translation (starting in the last line of this page) for us to talk about it. Students were interested, fascinated, and entertained by these ideas about science and medicine. But they also pointed out how so many elements actually match up with modern knowledge. We were able to talk about junctures and disjunctures, and how and why these types of texts might have appealed to the monks writing them and potential readers. One of the most striking students points raised was how these texts represent monastic ideals of organizing the world: they help to order and explain knowledge. In this, we concluded, for all of our modern scientific advancements, we’re not all that different from medieval people. And students acknowledged that the potential of medieval science to tell us something about our own pursuits is a nice way to understand the value in learning Old English.